Possession wins trophies or, in this case, ad dollars. That’s why Snapchat stepped up its game late last year by quietly partnering with Stats.com. Now TechCrunch has learned that Snapchat has rolled new Live Score geofilters at every NBA arena and some other matches. They let anyone attending overlay real-time updated score graphics atop their photos and videos. Just last week, Live Score geofilters saw 20 million views from 51 games. Snapchat is also still working with the NFL to produce Live Story compilations from the big games, and Live Score filters are available for those, too. The goal is to become the preferred way people share and consume sports on social media so Snapchat can soak up the ads that follow. It’s a cut-throat competition with Twitter, with Moments and Hashtags, and Facebook with its reach and new Stadium for sports chatter. But both of those networks are focused more on professional content that’s more similar to TV, and text-based discussion of the games. They’re either versions of the first-screen or complementary second-screens. Snapchat is something different. It shows you what it feels like to actually be at the game as a fan. It’s not just about the action on the field, but in the stands, in the parking lot and in the bar afterwards. That makes it appeal to people who don’t care as much about the nitty-gritty of sports, but enjoy the occasional fan experience. That’s a way bigger market. 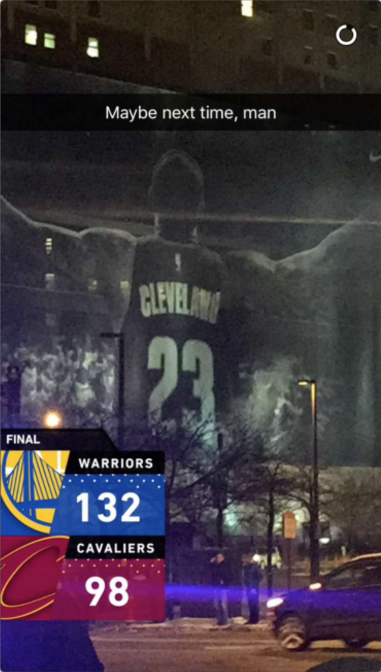 Live Score geofilters also take advantage of Snapchat’s unique feed. On Instagram or Twitter, repeatedly posting about a sports game can be annoying and will drown out everyone else in your friends’ feeds. On Facebook, real-time content often gets lost in the filtered feed. But Snapchat condenses all your posts, no matter how many you share, into a single line in a friends’ Snap inbox or Stories list. It’s pull, not push, social media. Friends only see your posts if they actively look for them. This way, you don’t feel guilty sharing Snaps from the game, and the Live Score, every few minutes. If people don’t want to see it all, they can avoid or fast-forward through it. On Facebook you might post once a day. On Snapchat or Twitter, a few times. But on Snapchat, you can go HAM. Share your pre-game, entrance to the stadium, outfit, seats, the action, the half-time, game-winning play, the celebration and everything after. All Snapchat has to do is convince you what you’re doing is special, and that’s what the Live Score filters do. The real-time sports social media race just heated up.